Wouldn’t you just know it? I haven’t been sick at all so far this year and less than a week to go before my holiday, I am fighting a chesty thing. It’s desperately trying to get the upper hand, but so far I think I’m winning. Let’s hope my immune system can keep fighting the good fight and send the chesty thing running snivelling home to its mummy! Whizz all ingredients except the lamb and nigella seeds in a blender or food processor. Put lamb, nigella seeds and marinade in a ziplock bag. Massage well to ensure lamb is completely coated. Leave for several hours or overnight in the fridge. 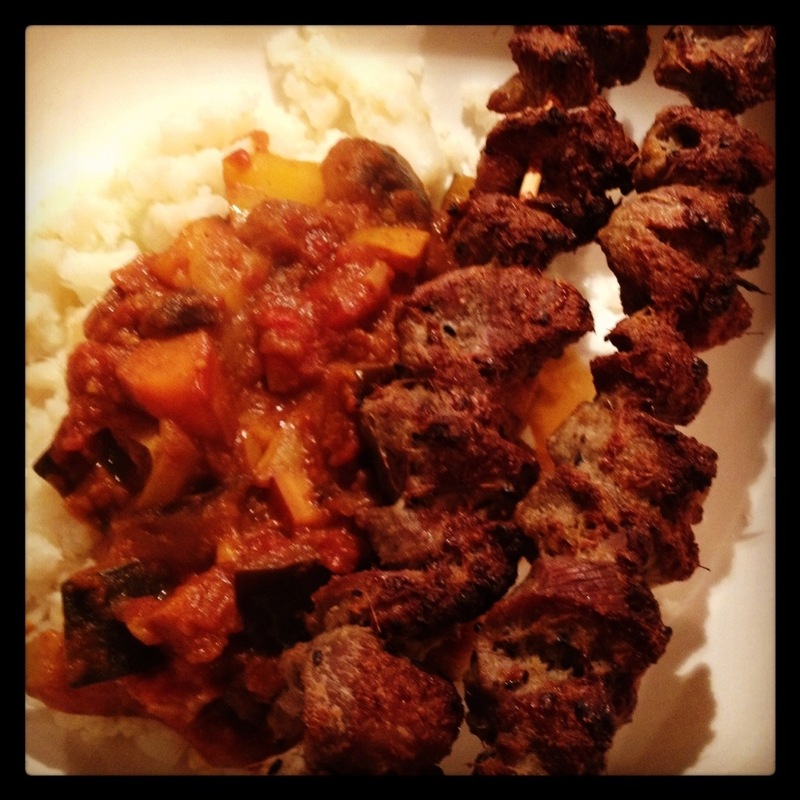 Thread lamb cubes onto skewers. Bake in the oven for 30 mins at 180C, or better still, fire up your barbecue and grill until cooked through. Melt the coconut oil in a large pan. Add aubergine and onion and fry until softened. Add garlic and spices. Toss over the heat for a few seconds. Allow to simmer for around 20-30 mins until veggies are tender. 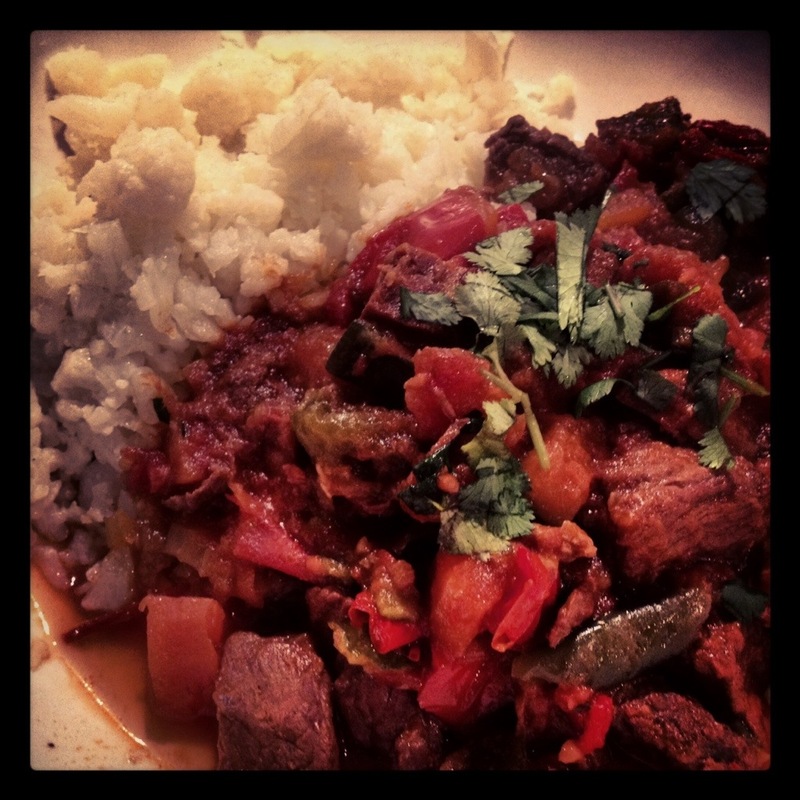 Serve with the lamb skewers and some cauliflower ‘rice’. 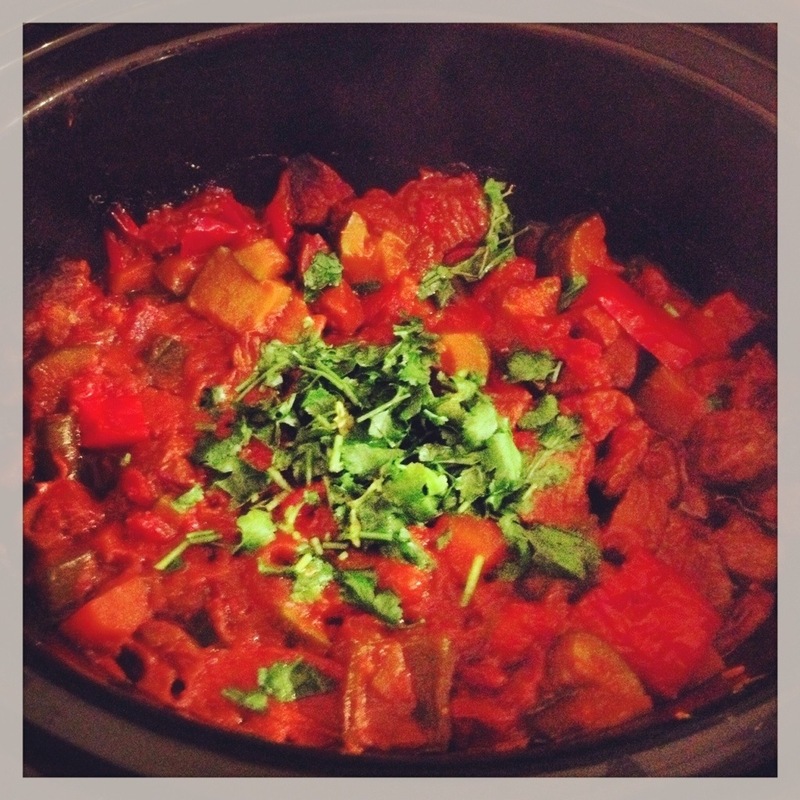 Posted in Meat dishes, Vegetable side dishes and tagged aubergine, chilli, coconut, courgette, cumin, curry, eggplant, garam masala, ginger, gluten-free, grain-free, Indian, low carb, Organic lamb, paleo, primal, skewers, sweet potato, tomato, whole-foods, zucchini. Bookmark the permalink. What a lovely afternoon/evening! The sun is shining, it’s quite warm (well, compared to the weather we’ve been having lately!) and the birds are chirping! Perfect for a spot of boxing in the park! 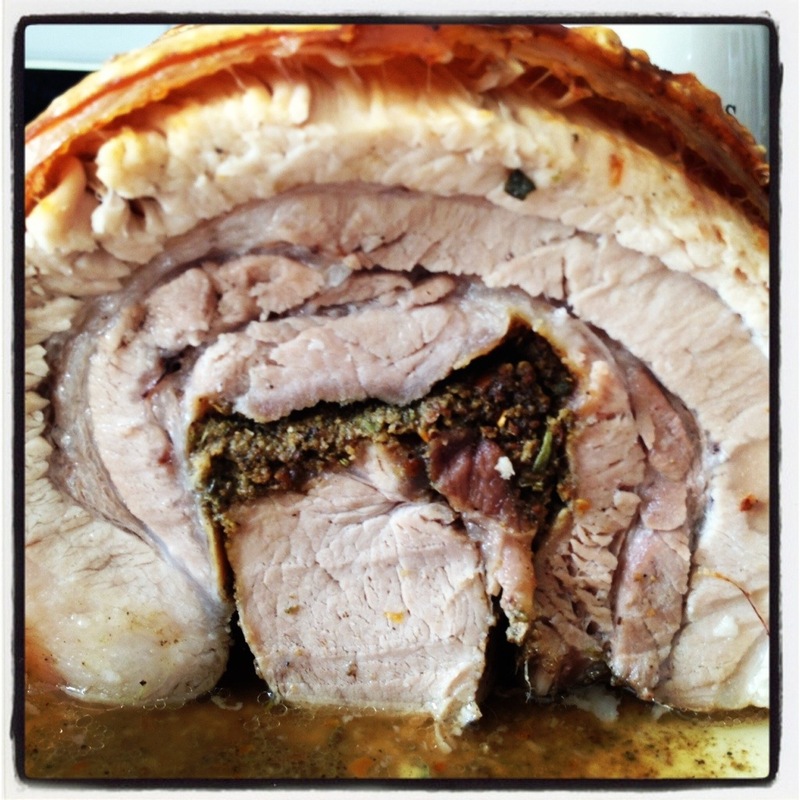 A promised, here is the recipe for the porchetta I made on Sunday (the day of the pig party!). Basically it is a pork belly, rubbed with spices on the inside and stuffed with a pork tenderloin. My butcher kindly gave me extra pork rind to completely enclose the meat, but in the end I didn’t use it as I wanted the juices and fat to seep out and into the veg in the bottom of the pan. I laid the pork on a bed of fennel bulbs which had been quartered and parsnips which were cut into chunky sticks. Feel free to omit or change the veg (I haven’t included them in the recipe). Put all ingredients except pork, EVOO and Himalayan salt into a food processor and blitz until it is finely ground and forms a dry-ish paste. Season the tenderloin with Himalayan salt. Set aside. Rub the meat side of the pork belly with the seasoning paste, making sure you go right to the edges. Place the tenderloin on top of the pork belly, tuck in any edges and roll up. Tie the joint with string in several places to keep everything together. Place in a roasting pan, with or without veg of your choice. After 40 mins, turn the oven down to 150 and cook for a further 2 hours. After 2 hours, turn the heat back up to 200C and cook for a further 20-30 mins to really crisp up the crackling. Remove from oven, cover loosely with foil and allow to rest for 10 mins before carving and serving. 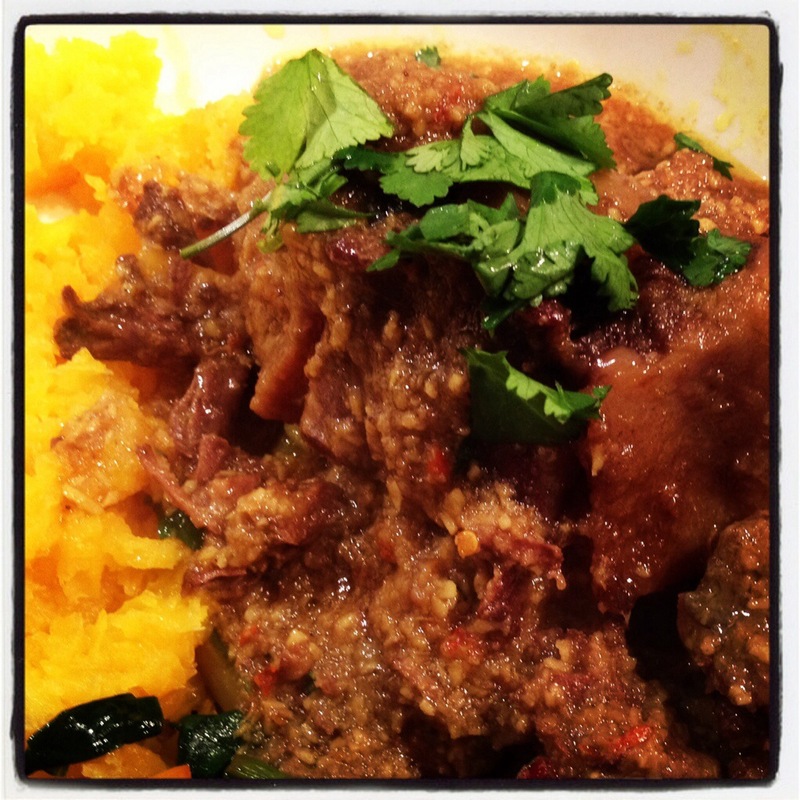 Posted in Meat dishes and tagged bay leaf, cumin, fennel, garlic, gluten-free, grain-free, juniper, low carb, meat, organic, outdoor reared pork, paleo, primal, red chilli, rosemary, sage, whole-foods. Bookmark the permalink. Today was the micro pig party for my niece! 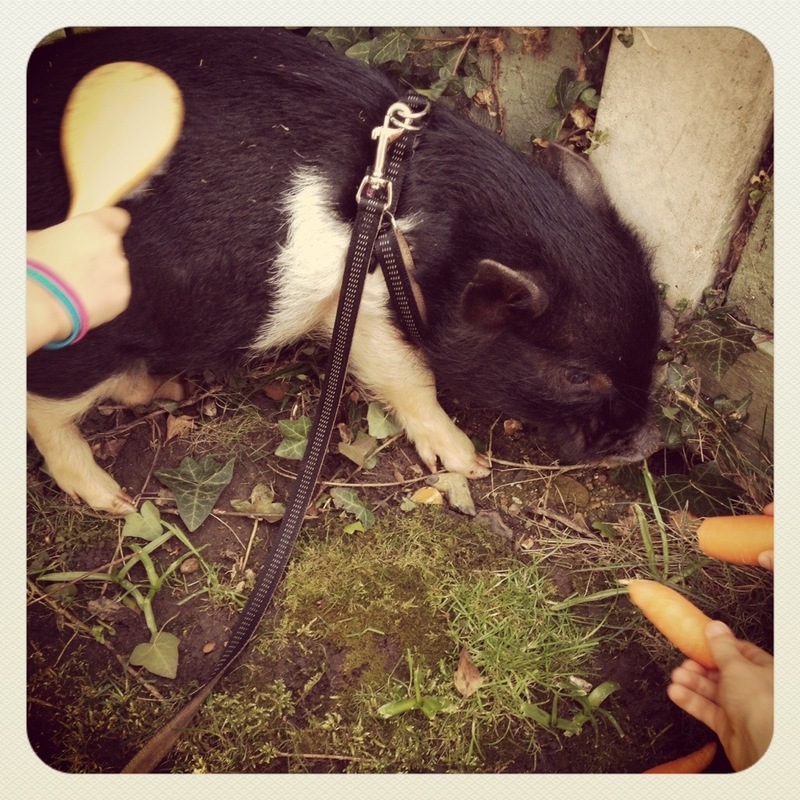 2 small pigs basically snuffled their way around my sister’s garden on leashes whilst the kids brushed them and fed them carrots. Just an hour earlier, I had stuffed my face with a porchetta roast and loved every bite of it! I guess years of vegetarianism end up causing a reverse reaction – I am now obsessed with eating meat! The porchetta recipe will be uploaded soon, but I felt it was insensitive to put it up today along with a picture of one of the pigs! 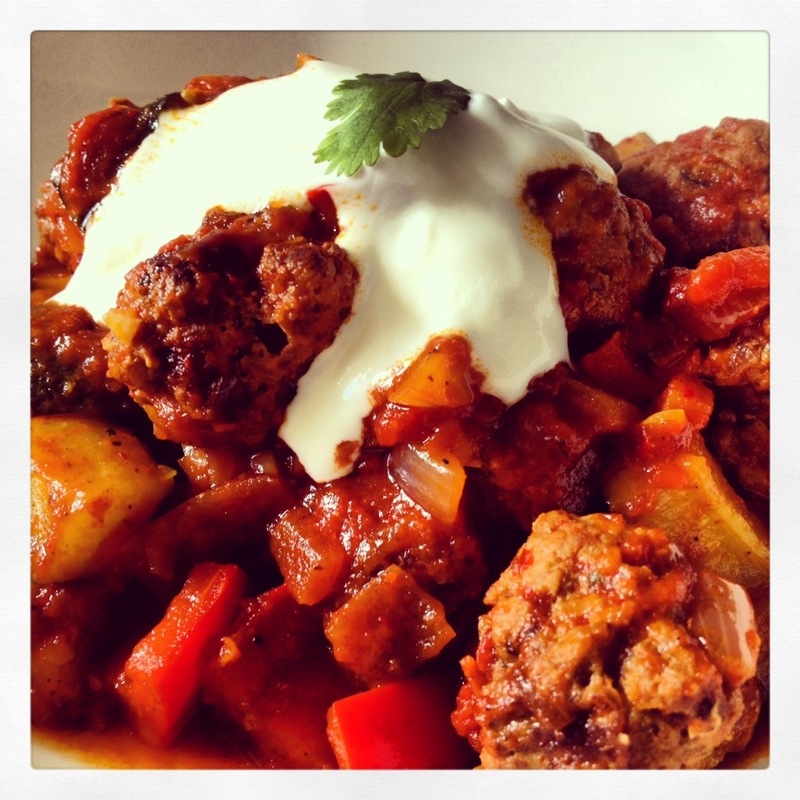 Instead I have decided to share yet another meatball recipe with you. 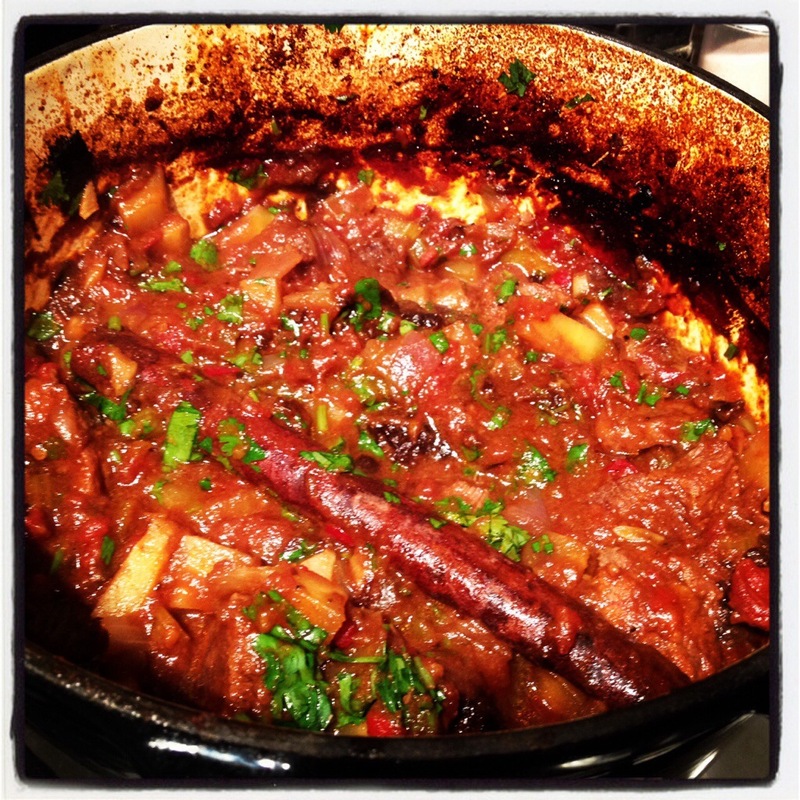 Lamb with Harissa in a Moroccan spiced veggie sauce. When you buy your Harissa, check the ingredients to make sure it doesn’t contain any dodgey ingredients (non-Paleo vegetable oils, sugars, additives etc). Mix the meatball ingredients together in a bowl. Fry in a deep saucepan or work until browned on all sides and some of the fat has rendered out. Pour off most of the fat. Add the veggies and sauté until they begin to tenderise. Add the spices, Harissa, tomatoes, salt and balsamic vinegar. Allow the dish to simmer for at least half an hour until the meatballs are cooked and the vegetables are tender. Serve on cauliflower ‘rice’ with a dollop of full fat Greek yogurt if you like. Micro pig at the party today. Posted in Meat dishes and tagged cinnamon, cumin, gluten-free, grain-free, Harissa, lamb, low carb, mint, organic vegetables, paleo, primal, tomatoes, wheat free, whole-foods. Bookmark the permalink. Today is day 6 of my 21 Day Sugar Detox (written by Diane Sanfilipo, for those of you interested who have never heard of it). So far so good. I’m not really craving sweet things too much, however tonight is going to be the real test! It’s Saturday and I’m going out with my boyfriend and some friends, but I am not allowed to drink alcohol (at all!) This is going to be a real challenge. I’m not an alcoholic by any means, but I do enjoy a drink (or two) in a social setting. However, I am determined to prove to myself that I can go for three weeks without it! It’s a beautiful sunny morning in West London – perfect weather for training a client outdoors. I decided this morning was the morning for some Mexican flavours for breakfast. 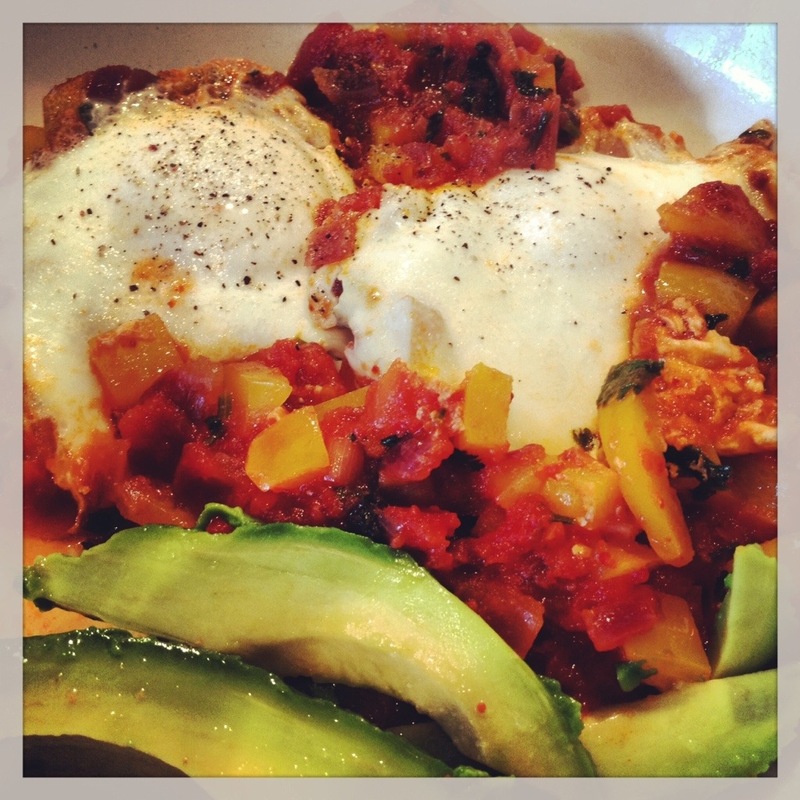 One of my boyfriend and my favourite breakfast/brunch dishes is Huevos Rancheros. I always find the kick from the chillies first thing in the morning gives me a spring in my step for the rest of the day. I used to make this dish with black beans or refried beans on whole wheat tortillas before adopting a Primal way of eating. To be honest, I don’t miss either the beans or the tortilla as both are the least flavourful part of the dish anyway. This morning I served it with sliced avocado as I was in a hurry to get to my session, however if you have more time, feel free to make the avocado into guacamole (I posted a recipe for this previously with the Mexican spiced Tuna). Sauté the onion in a frying pan in the oil until slightly translucent. Add the pepper and continue to sauté until it begins to soften. Add the cumin and chipotle, stir to mix. Add the tomatoes and season with sea salt. Leave to simmer while you chop the cilantro. Add the cilantro and mix well. 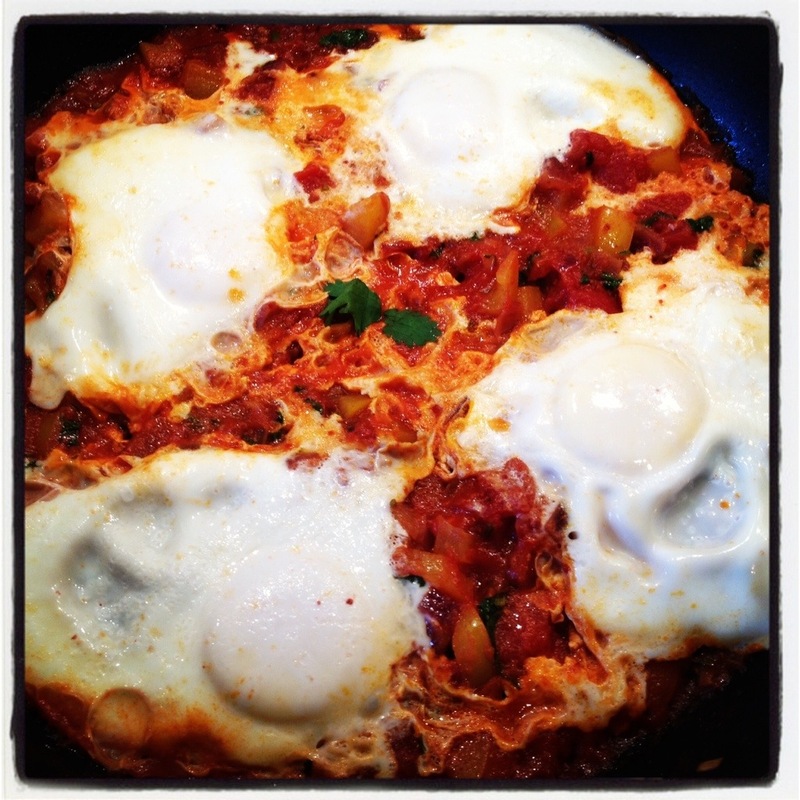 Crack the eggs onto the top of the tomato sauce, and cover the pan to help the eggs cook. I like my egg yolks soft, so I left them to cook for around 4 mins. The yolks were still sticky and slightly runny in the very centre. Cook longer if you want completely solid yolks. Serve with the sliced avocado, and a squeeze of lime juice. Posted in Breakfast and tagged bell peppers, breakfast, brunch, chillies, chipotle, cilantro, coriander, cumin, eggs, free-range, gluten-free, grain-free, low carb, Mexican, onions, organic, paleo, primal, Tex Mex, tomatoes, whole-foods. Bookmark the permalink. Good Lord it was cold and snowed most of the day in London (although it didn’t really settle). Unfortunately I was either in a gym with no heating, or out in the elements today. Luckily I had this delicious, warming dish to come home to after a cold and wet bootcamp this evening. In a large pan heat the oil and sauté the onion. Add the garlic and fry for a couple of minutes. Add the beef and cook until each chunk has been seared on all sides. Add the chorizo and fry for several minutes to release some of the fat. Next add the veggies and sauté until they start to soften. Sprinkle in the spices and oregano, pour the tomatoes over the top, stir in the honey and season with salt and pepper. Transfer to the slow cooker and leave on high for 6 hours. Just before serving, mix the fresh coriander leaves into the casserole, reserving a few as a garnish. Boil or steam cauliflower until very tender. Drain and mash the cauliflower with a fork or potato masher. Posted in Meat dishes and tagged Beef, cauliflower, chipotle, courgettes, cumin, gluten-free, grain-free, green pepper, meat, organic, paleo, primal, red pepper, smoked paprika, zucchini. Bookmark the permalink.